It is the aim of this course to address all those GMP Compliance issues that are currently discussed as hot topics in analytical quality control laboratories and during GMP-/FDA-Inspections. This course will give an update about the actual regulatory requirements (EU, US, WHO, etc.) and will show how these requirements can be put into practice. In addition this course will look at scientific and regulatory trends to be expected in the future. Due to changing regulatory requirements pharmaceutical quality control units are continuously facing new challenges. There are many regulatory requirements relevant for the pharmaceutical quality control, both in EU and in the US, for instance EU GMP Guide, 21 CFR Part 210/211 (USA), EMA and FDA Guidances, WHO Recommendations and Pharmacopoeias (Ph.Eur., USP, JP). 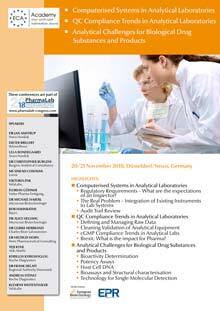 Laboratory Managers and Analytical Scientists must be familiar with all these GMP-related topics and must be aware of the latest updates and the current interpretation of all these guidance documents. In addition, analytical QC laboratories are increasingly in the focus of GMP inspections, both in Europe and in the US. Many laboratory-specific citations can be found after inspections of European GMP supervisory authorities in EU Non GMP Compliance Reports or after FDA inspections in 483s and Warning Letters. Currently the status of FDA inspections and the impact for analytical labs is of great importance. Discuss with us the future of FDA-inspections in the light of the MRA and get some understanding what this means for your QC-labs. Furthermore the uncertainty about the consequences of the Brexit for the pharmaceutical industry is a huge challenge for all QC Mangers and QPs. Get some insights what this means for manufacture, testing and release as of 30. March 2019 and how to get prepared for this changes. Cleaning Validation for Analytical Equipment – what are the regulatory expectations today and how to implement in your lab? from quality control units in the pharmaceutical industry (routine QC and in research and development) who are responsible for GMP Compliance in the analytical laboratory. This course is also intended for employees working in contract labs being involved in development of methods, control testing and Quality Assurance. GMP News: What is important for you? Brexit: What is the impact for Pharma? Compliance: How to ensure compliance and avoid data integrity problems? Transfer of methods: What is important? ICH Q12 and Life-cycle Management: What are key-aspects for the lab? FDA-Trends and News: What should you consider? MRA: What is the status and impact for you? Inspections in Labs: How can you successfully prepare for the FDA-inspection? Currently responsible for maintaining cross-organisational (and cross-country) laboratory processes. Head of Quality Control within Wiewelhove, a medium-sized CMO, focused on solid oral dosage forms. Chairman of the ECA Analytical Quality Control Working Group. Qualified Person” in the EU. Member of the USP Expert Panel on Validation and Verification entrusted to revise General Chapters. Managing director of HORN PHARMACEUTICAL CONSULTING with focus on CMC, GMP and Regulatory Affairs (EU and US). Senior Chemist, Laboratory Automation Development. Heads a team of specialist within data integrity and computerized systems validation in the QC laboratories. GMP Inspector with focus on Inspection of drug manufacturers and laboratories in Germany and countries outside of the EU.